We, at The Apothecary are partial to a nice bit of chocolate and once of the good things about opening this shop was being able to stock some of our favourite brands of chocolate! The first brand we got in was Willie's Cacao because we have loved Willie since we first saw him on television going through the trials and tribulations of launching his brand of lovely chocolate. We have been fans of single estate chocolates for some time now so it was brilliant to discover that he has a range of flavoured chocolates called inclusion bars - we couldn't wait to get them in and believe me they didn't disappoint. We have a wonderful chocolate evening to celebrate getting them in, we brewed chocolate teas and made some recipes from Willies Chocolate Bible. The food was lovely and we became big fans of his recipes too! We made the Cacao and Olive bread (absolutely delicious, and even better toasted!) the macaroons (very yummy indeed) and the chocolate cloud cake (has to be tasted to be believed!!!) Our taste buds had great fun that evening! 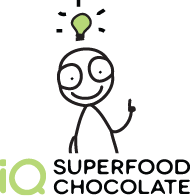 We had lots of requests from customers for raw chocolate so we we went on the hunt for a small ethical raw chocolate producer and found IQ Chocolate. This company was started by 2 women in Edinburgh who decided they wanted to create a chocolate bar that was handmade from Bean-To-Bar retaining the raw SuperFood nutrients and antioxidants of cacao, containing fewer calories, with a taste, texture and snap that would delight chocolate-boffins and the health-conscious alike. After much research, testing, tasting and perfecting they came up with their fabulous range of chocolates which we now have in stock. Last but not least, the most recent addition to our chocolate range is Rococo Chocolate, this is not raw but is organic, tastes delicious and we have chosen the bars that complement our other products so we have Earl Grey Tea, Rose, Violet, and a whole host of herbs, spices and floral flavours in dark milk and white organic chocolate. Rococo chocolates are based in London and their chocolatier is Chantal Coady, a pioneer in the chocolate world bringing a fresh and vibrant touch to a once stuffy profession!